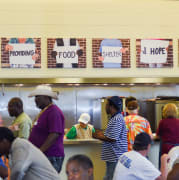 Samaritan Ministries is the only Soup Kitchen in Winston Salem. We regularly serve lunch to 300-400 men, women and children free of charge. Volunteers are needed to help prepare and serve lunch in the Soup Kitchen from 9am-1:30pm, Monday-Saturday and 10am-2:30pm on Sundays. No experience required! You may sign up for one time or join a regularly scheduled team. Please visit our website to view and sign up for a shift!